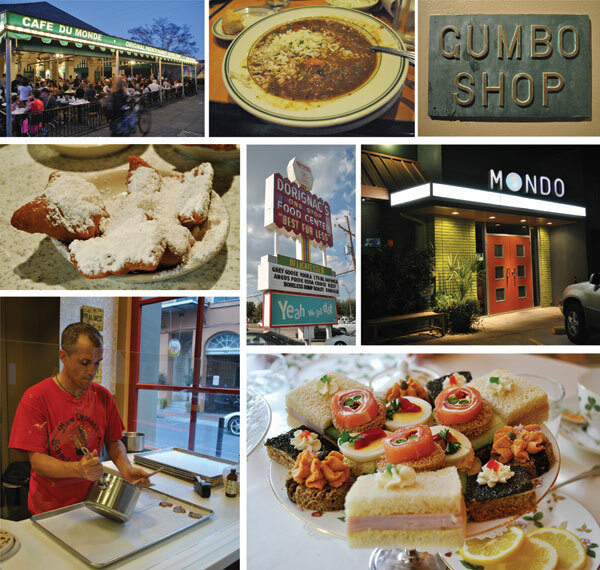 Here's a quick food rundown for our trip to New Orleans this fall. As you can see, we ate our way through the town. Cafe du Monde beignets, Gumbo Shop chicken and andouille sausage gumbo, Dorignac's grocery store for Creole Cream Cheese and Nectar Syrup along with other New Orleans classics, Mondo is a Susan Spicer restaurant where we had a fabulous meal, New Orleans School of Cooking pralines being made, Afternoon tea at Windsor Court Hotel with the salmon and caviar upgrade. Places not pictured: Refuel has the best grits in town and the friendliest owner ever, Camelia Grill is a classic for breakfast and we heard that they have the best creme pies, Deanie's has nectar cream sodas and great boiled and fried seafood, Acme Oyster House has great oysters, if you're into that, but I just had a wonderful piece of fish. Oh my gosh, I am so hungry after seeing these photos! YUM!! !